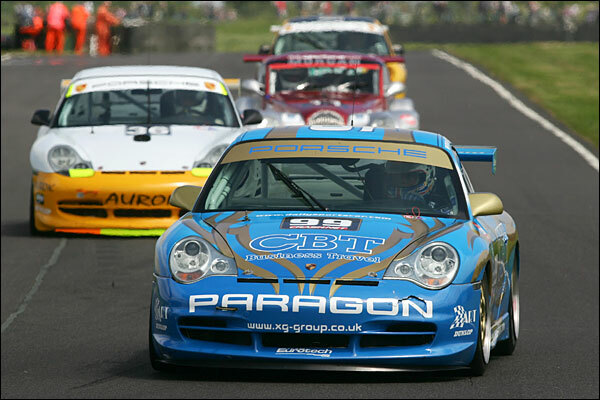 Mark Sumpter was playing super sub in the #99 CBT / Eurotech Porsche 911 GT3 at Castle Combe, the circuit where he won alongside Mike Jordan in 2004, in one of Eurotech's GT2 class Porsches. The first qualifying session showed that he hadn't lost his touch, the #99 Porsche finishing in a season's best third slot, behind the rapid Team Tiger Marcos and Marco Attard's Damax Ferrari. In session two, to set the order for Sunday's grid, Steve Wood found himself chasing a gaggle of Ferraris, the Wiltshire circuit clearly very much to their liking, before ending the session seventh (in the more competitive qualifying session) out of 13 starters. Fast and steady was the successful game plan employed by Sumpter and Wood for the first of the weekend's hour long races. Mark Sumpter took the opening stint of this one and had a quiet opening ten minutes, well in touch though with the leading group: the Porsche was running very strongly, but the Team Tiger Marcos led the class. 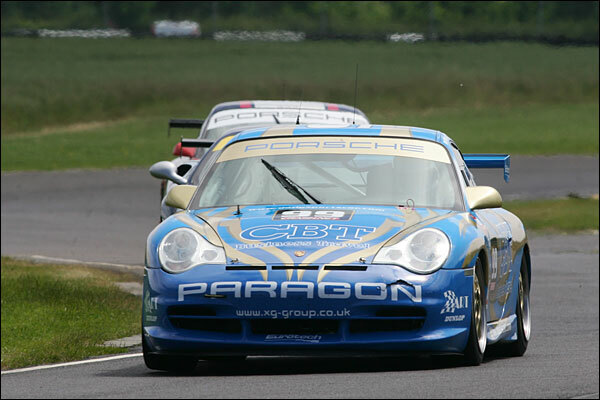 With the retirement of the third in class Damax Ferrari, a driveshaft letting go with a bang, mark Sumpter was up to fifth in class and was closing in on the Trackspeed Porsche. With the pitstop window approaching, Chris Beighton's Marcos still held a commanding advantage, from Miles Hulford in the second Damax 360 and Dimitris Deverikos in the Tech 9 Porsche. But Mark Sumpter was now getting in on the act, the CBT / Eurotech supersub drawing ever closer to Fred Moss. This was a great battle, the train of four cars contesting second through to fifth places in the class, barely a second between all four. Hulford would eventually lose out to Deverikos, Moss and Sumpter as the pit stop window approached, Mark up to fourth in class and well in touch with the cars ahead - apart from the charging Marcos, now some 14 seconds up the road. First to pit was Hector Lester in the #21 UCB Ferrari 360, Allan Simonsen taking over. Sumpter was amongst the final stoppers, Steve Wood, with the bit between his teeth, was soon back into the fray at around the halfway mark. Simonsen had already grabbed the CBT car's fourth spot and was soon up to second in class, with the Marcos looking uncatchable, 21 seconds up the road. GT racing though is a cruel sport at times and the Marcos was forced to pit with a broken wheel, after an utterly dominant run. Simonsen now led GT3, with CBT back up in a fighting fourth place. There was more trouble too, Piers Masarati pitting with smoke pouring from the left rear. It would cost the #9 car almost a full lap and would leave a rather unfamiliar top three. Steve Wood was now in a podium position but it wasn't going to be easy. 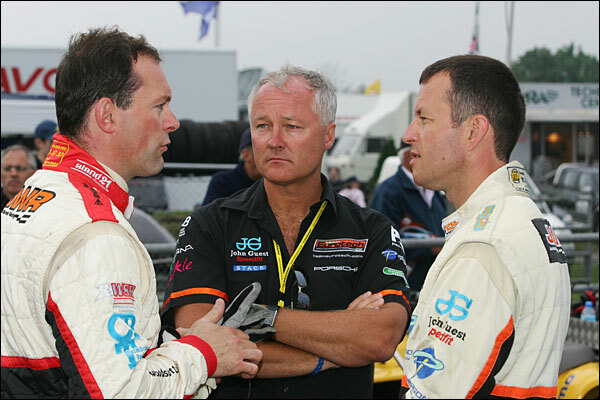 Closing in fast was the very quick Julian Westwood in the Team Parker Porsche, but Steve was in tenacious mood and the #30 Porsche would not get closer than around a second adrift. So it ended with a well deserved win for Allan Simonsen and Hector Lester, ahead of a delighted David Ashburn and Fred Moss - with an absolutely ecstatic Steve Wood and Mark Sumpter in third place. Both drivers absolutely soaked Stuart Scott with their celebratory champagne as the trophies were handed out: a great day for all three men and for the CBT /Eurotech squad. 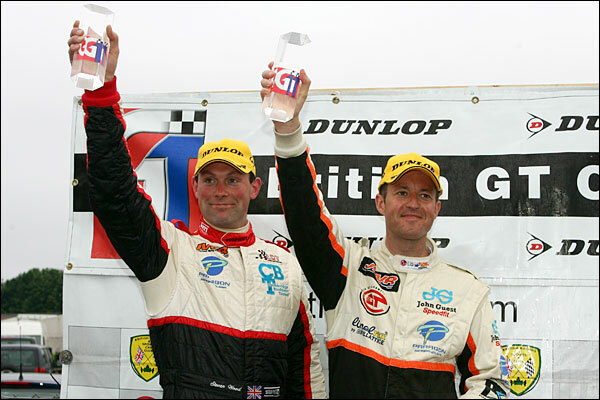 Steve Wood: "Mark drove a brilliant stint and Eurotech gave us a great pit stop. The car was spot on but Piers Masarati gave me a very tough time: he tapped me into a quick spin but I got her going again very quickly and drove as quick as I could to the end. I want to really thank Stuart (Scott) for sticking with me after a very tough run, and for letting Mark race with me here. He's a top man." Mark Sumpter: "Great stuff, I just hope Stuart lets me have another go!" Steve Wood had been caught out with a "solid brake pedal" at entirely the wrong moment, possibly an ABS sensor failure. Some swift thinking prevented a head on impact with the barrier, but the glancing blow was enough to finish the car's race, and inflict significant damage. 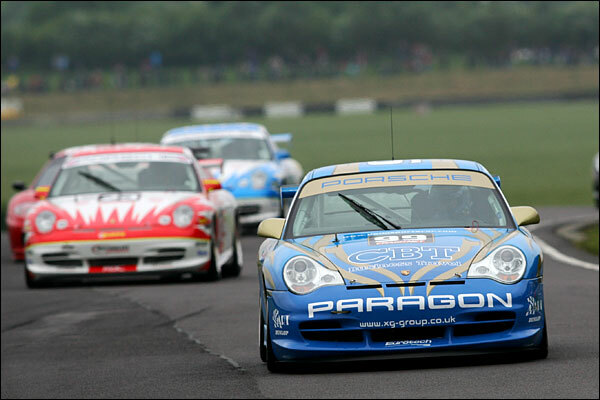 It was to lead to a Safety Car that set up a grandstand finish to a thrilling race. That was no consolation though to the #99 Porsche squad – a tough end to a weekend that had started on such a high.